AOFM PRO Creative Beauty Agency. Makeup, Hair and Nails. AOFM Pro is a high-profile creative agency, specializing in supplying teams of beauty professionals such as makeup artists, hairstylists and nail technicians. 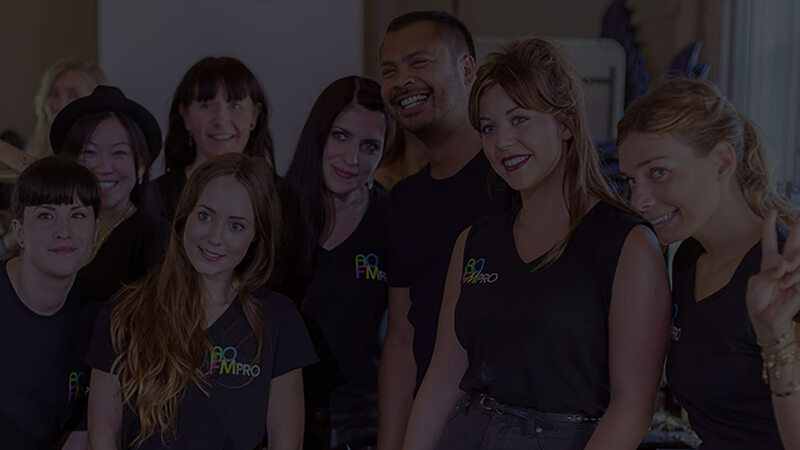 AOFM Pro was Founded by Jana Ririnui in 2006, with the aim vision to supply clients with freelance creative beauty talent who deliver a high-quality professional service. This has to seen AOFMpro grow over the years to be one of the most sought-after backstage and fashion industry elite teams of talent booked to date. Known globally within the fashion industry as a leader in supplying backstage makeup teams for fashion shows, with teams supplied backstage and on schedule at fashion week shows in each of the fashion capitals, every season alongside some of the world’s most elite designers and brands. AOFM Pro’s work spans across London, New York, Paris, Milan, Tokyo, Moscow and Berlin. AOFM Pro teams have worked with designers such as Victor & Rolf, Bora Aksu, Eudon Choi, Moncler and Paul Costelloe; as well as trunk shows for Dior, Pucci DKNY, and Max Mara as well as countless celebrities and fashion magazines. AOFM Pro provides an unrivalled variety of talent within the industry, coupled with a level of experience and expertise that has to lead them to become the first choice for countless designers globally. With contact centres in London, Paris, New York, and Milan, we can deliver our professional expertise within the 4 main fashion capitals of the world. If you have a project, a show, magazine shoot, or just simply a beauty creative, look no further the AOFM Pro Creatives Agency.